I was reading a popular women's fashion magazine in a cafe one Saturday morning when I noted a heading, 'New Beauty Rules'. This got me thinking about the term, 'Beauty Rules' and what it means to different people. Some internet research revealed a wide variety of 'rules'. Many articles concentrate on general rules such as always removing makeup before going to bed. Others look at the health side of beauty, perhaps with some rules about looking after your 'inner beauty'. For some, beauty rules are all about how to wear makeup, what sort, how much and what techniques to use for applying it. There are rules about the clothes and accessories you 'should' wear to make you 'more beautiful'. There are articles about beauty rules for brides, for college students, the over 30s and those over 50. There are beauty rules from numerous film stars, singers and some said to have been followed by Princess Diana. 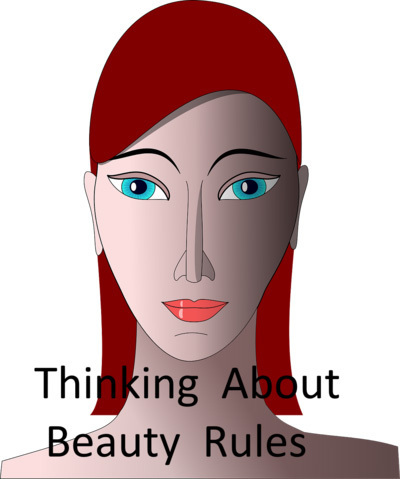 I don't often read beauty rules these days , although I did when I was younger, much younger. Reading a few of these current articles brought rules I didn't know existed to my attention. In the end I decided I am glad I don't bother with trying to follow the rules now, too confusing. If something looks good to me, I'll wear it or do it without checking a list of rules to see if it is 'appropriate' for my age. When I am uncomfortable with the way I look or I feel physically uncomfortable, I'll try something else rather than following rules. One useful thing I read was this quote by writer, comedian, actress, producer, Tina Fey, "If you retain nothing else, always remember the most important Rule of Beauty. 'Who cares?' "